Cyrious Software's reporting functions are an easy, accurate, reliable way to ensure that your bank receives the correct information in a timely manner. Additionally, reporting serves as a double-check for your own internal accounting purposes. The main menu is the easiest place to access your reports. The Reports menu expands to show every kind of report you have created and store in your system. This makes reports instantly accessible when you need them most – on our way out the door for a meeting, when it's 4:59 PM and you need to close the shop, or when your Executive Accountant at Headquarters needs your state sales tax report faxed over immediately. Below we have included a few examples of submenu reports and which reports are included with them. For a more comprehensive listing of all standard reports included with Cyrious Control (the information they display, options and fields for each report, and a sample screenshot), request a digital copy of our Control Reports Reference Guide. Standard Accounting Reports - Contains another sub-menu with various reports related to your business' financial standing, such as the Balance Sheet, Income Statement, and Statement of Cash Flow reports. 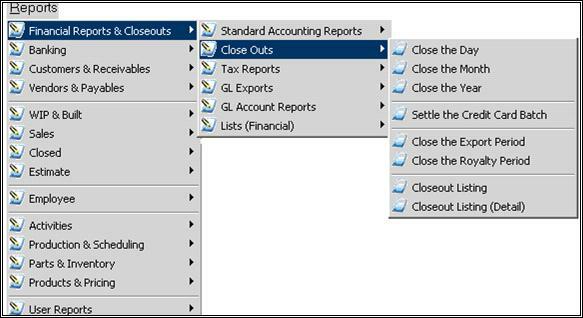 Close Outs - Expands to grant access to daily, monthly, and yearly close out reports; royalty and export reports; credit card settlement report; and close out listing reports with and without detail. Tax Reports - Expands to grant access to a variety of sales tax reports, such as a Sales Tax Summary. GL Export - Expands to grant access to QuickBooks, MYOB, Simply Accounting, DacEasy, Peachtree, Generic, and Small Business Financial close out reports. GL Account Reports - Expands to grant access to various GL change reports. Lists (financial) - Expands to grant access to the Account Code listing and Chart of Account changes reports. Converted Estimate Reports - Expands to grant access to a general converted estimates report and converted estimates reports that are grouped by customer, entered by, and primary salesperson. Pending Estimate Reports - Expands to grant access to a general pending estimates report and pending estimates reports that are grouped by customer, entered by, primary salesperson and disposition. Rejected Estimate Reports - Expands to grant access to a general rejected estimates report and rejected estimates reports that are grouped by customer, entered by, primary salesperson and disposition. 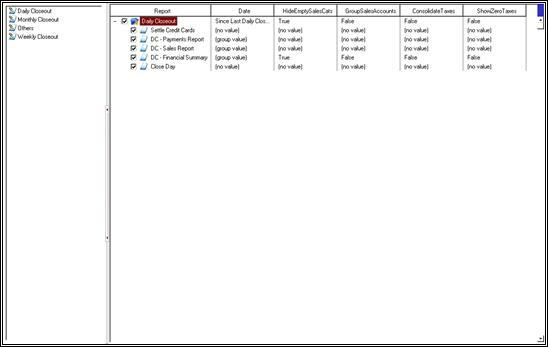 Voided Estimate Reports - Expands to grant access to a general voided estimates report and voided estimates reports that are grouped by customer, entered by, primary salesperson and disposition. .. More Estimate Analysis Reports - Expands to grant access to a general voided estimates report and voided estimates reports that are grouped by customer, entered by, primary salesperson and disposition. Payments Report - Lists all payments for the day. Payments by Customer Reports - Lists all payments made by individual customers. Payments by Division Received At - Lists all payments and grouped by division received at. Processed Credit Cards - Lists all processed credit cards. Processed Credit Card Attempts - Lists all processed credit card attempts. Credit Card Expiration Report - Lists all credit card expiration dates. Scheduled Payments Report - Lists all scheduled payments. Open Deposits on Orders - Lists deposits customers have made on orders. Voided Payments - Lists all voided payments. Analysis by Category Expands to grant access to analysis reports categorized by one of the following: calendar month, customer origin, industry, order origin, postal code, product, product category, customer (volume) or customer (frequency). Analysis by Salesperson Expands to grant access to the following: sales - all salespeople, sales - primary salesperson, and sales - yearly sales by salesperson. Commission Reports Expands to grant access to several different commissions reports, including commission based on: sales by margin, sales by price, orders placed by price, closed by margin, and closed by price. Sales - Order Discounts Displays discounts given on orders in a selected time frame. Sales by Sales Account Displays sales for a selected time frame grouped by sale account. Sales Report Displays sales for a selected time frame grouped by primary salesperson and product. Sales - Yearly Sales by Calendar Month Displays a graph with sales for the year to date broken by month. Sales - By Calendar Month Lists all sales made by calendar month. Sales - By Customer Origin Lists all sales made by customer origin. Sales - By Industry Lists all sales made by industry. Sales - By Order Origin Lists all sales made by order origin. Sales - By Postal Code Lists all sales made by postal code. Sales - By Product Lists all sales made by product. Sales - By Product Category Lists all sales made by product category. Sales - By Customer (Volume) Lists all sales made by customer (volume). Sales - By Customer (Frequency) Lists all sales made by customer (frequency). Time Clock Reports Offers various time clock reporting options, such as time clock information for the previous week. Active Employee Listing Lists all actively employed personnel. Employee Sales Report Prints a sales report showing all employees, not just salespersons. Employee Summary Prints an employee summary. Employee Labels Prints labels for all employees, or can be modified to print labels for only active or inactive employees. Employee List w/Barcodes Prints an employee list that includes a barcode for each employee. Estimated to Actual Reports Expands to grant access to an Estimated vs. Actual Cost Summary; an Estimated vs. Actual Cost Summary by order, part, and primary salesperson; and an Estimated vs. Actual Cost Details by Product Category. Usage Reports Expands to grant access to 4 different usage reports: Part Usage by Part Type, Part Usage by Category, Part Usage by Order, and Part Usage by Station. Lists Expands to grant access to the Part Inventory Adjustments report, as well as the Parts Listing. It also includes a Parts - 1 Part Only Report and a Parts - All or Multiple Parts Report. Cost Analysis by Order Gives a breakdown of each orders estimated cost and actual cost; orders are grouped by salesperson. Purchased Parts By Vendor Gives a breakdown of parts ordered, quantity, price, and average price per unit. The information is grouped by vendor. By Category - Expands to grant access to the Activities - All Activities report, Activities - By Customer report, and the Activities - for Salesperson report. Completed Activities - Expands to grant access to the Completed Activities - by Customer report, Completed Activities - by Employee report, and the Completed Activities - by Estimate report. 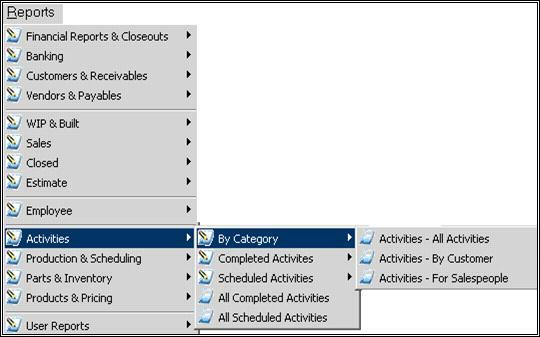 Scheduled Activities - Expands to grant access to the Scheduled Activities - by Estimate report, Scheduled Activities - by Employee report, the Scheduled Activities - by Customer report, and the Scheduled Activities - by Order Report. All Completed Activities - Lists all completed activities. All Scheduled Activities - Lists all scheduled activities. 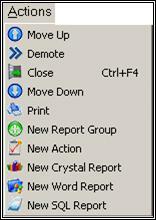 The Quick Reports screen displays groups of reports and actions for different functions. For instance, there is a Daily Closeout group, a Monthly Closeout group, and more. The Daily Closeout group holds the following reports and actions; for a more comprehensive listing of Quick Reports, please request a digital copy of our Control Reports Reference Guide. Settle Credit Cards Settles any credit card payments you have received since the last daily closeout. DC-Payments Report Lists all payments received since the last daily closeout. 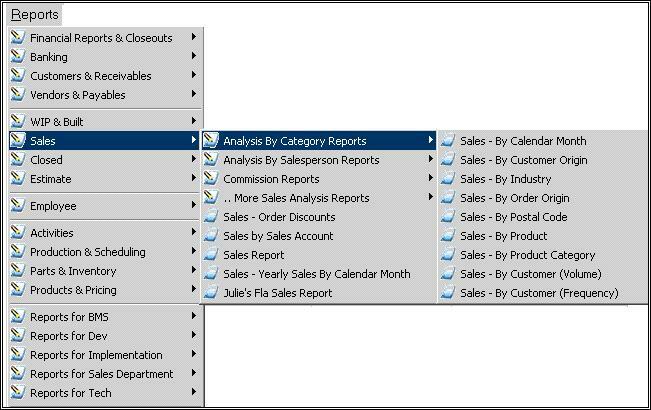 DC-Sales Report Displays sales for the day grouped by primary salesperson and product. DC-Financial Summary Displays the Balance Sheet changes for the day and Income and Expense Summary on one page. Close Day This action prints the reports contained in the Daily Closeout group. Print Prints the selected order, estimate, company, etc. New Report Group Creates a new report group. New Action Opens a new action item. New Crystal Report Creates a new Crystal report. New Word Report Creates a new Word report. Daily close outs are typically performed before the cash drawer is deposited with the bank. For new shops, this may be once or twice a week, while more established stores typically do this daily. The Daily Activity Report, which is usually the first report printed in the daily closeout, contains a summary of all accounting and payment transactions since the last daily close out. Among other things, this report lists the payments by payment group (cash, check, etc.) and reconciles the cash drawer prior to making any bank deposits. Two additional reports, the Daily Payments Report and the Daily Orders Picked-Up (Sales) Report are also usually printed with the daily closeout. These reports provide more detail than the daily activity report and can be used for reconciliation that is more detailed. The User can also specify other reports printed with each daily closeout. Although weekly close out reports are not commonplace, they do help with reconciliation should you need them. Monthly close outs are typically performed at the end of each month to close out the sales figures. Additional reports like the sales tax report, royalty report, commission report, sales breakdown by industry, sales breakdown by category, and others are often printed at this time. The depth of analysis desired will determine which reports are printed. Additionally, many managers prefer a printout of the accounts receivable listing at least once a month. Cyrious offers a report for just about every need a professional in the industry could need. However, our software also allows you to create your own reports. Our Implementation Team is happy to help you create these reports. Closing out is an important part of disciplined accounting procedures. Cyrious uses daily, weekly, and monthly close outs to help simplify reporting procedures and practices.